Many of you may be interested to know that Bad Moms 3 hit Albury Wodonga recently. Yep, I am only just able to write of it now 6 weeks following the “incident”. It’s tough being a mum. As it turns out, it’s tough being a mum and a health (un)professional! In our family, just 6 weeks ago, we sustained our first broken bone. Our 9 year old daughter Lucy, received a pair of Heely shoes for Christmas- thanks very much Santa! For those of you who don’t know “Heelys”, they appear like a casual sneaker but have a wheel under the heel of each shoe. Lot’s of fun! Needless to say, Lucy had a lovely Sunday morning rolling around the footpath at the park on her Heelys until it was time to get in the car and head home. She didn’t see a lip in the concrete and went A over Z! I am pretty sure I saw her feet bend backwards over to her ears. As a mother of two girls, this is undoubtedly our best stack yet. Of course we scooped her up, dusted her off and reassured her that she was ok. She has got a low pain threshold, she gets that from her father. Admittedly and with the benefit of hindsight, she was a little quieter than normal after an injury. Is that always the case, when it IS actually serious they tend to keep it together a little more? 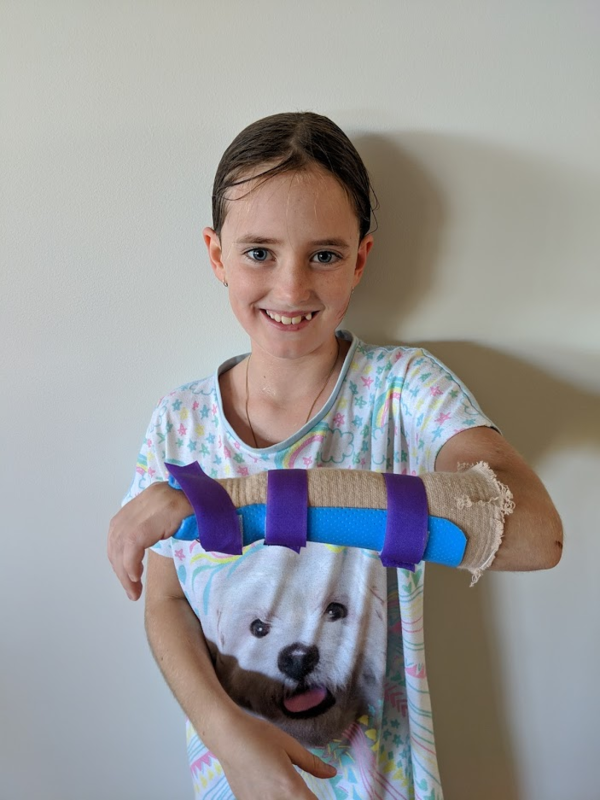 Anyway we washed her knees, band-aided, provided a tubigrip bandage for the sore wrist and provided her a quiet afternoon “luge training” in front of the TV. The next day she commented that her wrist was sore but off she went to school. One of our lovely teachers contacted me during the day to say Lucy was not quite herself and that she has reported her wrist being sore- she was allowing her some quiet time. I met Lucy off the bus and following the after school routine, we removed her bandage to reveal a quite swollen wrist. Off we went to get an x-ray which confirmed a small fracture just above the wrist joint. Thankfully I know people, (arguably better skilled and more sympathetic than I) and we were into the first available appointment with our hand therapist at Osteohealth. Lucy is proudly sporting a blue and purple cast, however the novelty is quickly wearing off! You will all be happy to hear that Lucy has made a full recovery since “the incident”. She appears to harbour no ill feelings towards her ‘bad mum’. Her big sister, 11 year old Clare took full advantage of my mother’s guilt in the days following and reported that she was sick in the tummy. “Oh my goodness Tom, it’s probably appendicitis? !”, so we kept her home from school. After having read this you may be hesitant to book in with me, so you may like to know that Osteohealth has loads of other GREAT practitioners! They can be your first port of call for acute sporting and leisure activities. All of our therapists can assess and refer for imaging (if required) to get you back to what you love doing quickly and safely. It’s tough as a mum to be objective in this situation, as I found out the hard way. P.P.S The authorities have agreed that Lucy s allowed to remain living with us… for now.